2015-12-21 Assigned to COLUMBIAN CHEMICALS COMPANY reassignment COLUMBIAN CHEMICALS COMPANY RELEASE (REEL 026480 / FRAME 0804) Assignors: BANK OF AMERICA, N.A. A composition comprising particulate carbonaceous material and a sulfonated conducting polymer containing hetero atoms. The composition can further comprise a metal. Devices comprising the composition can be constructed including supported electrocatalysts, membrane electrode assemblies, and fuel cells. 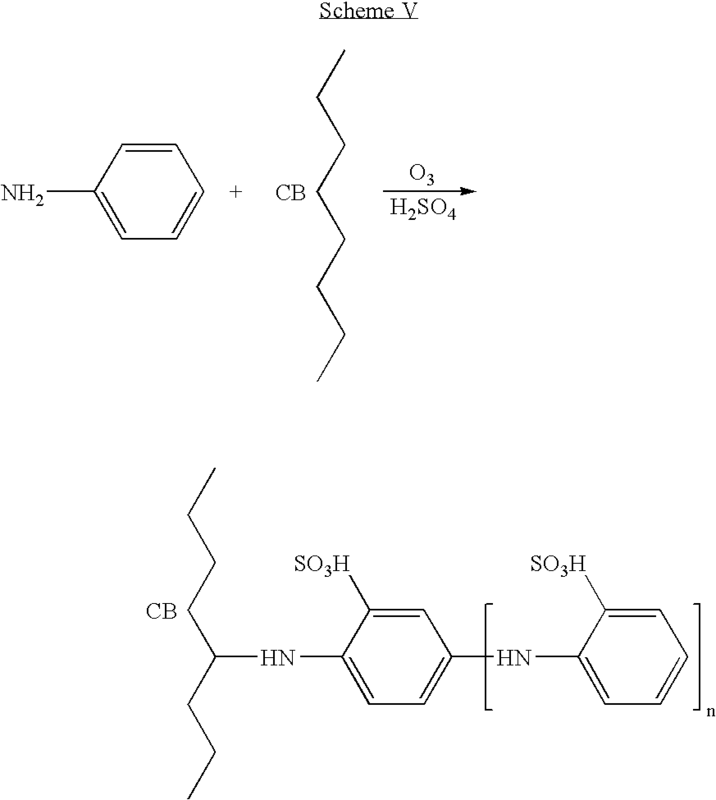 A method for preparing the composition comprises oxidatively polymerizing with ozone a monomer of a conducting polymer containing hetero atoms in the presence of a carbonaceous material and sulfonating the polymer or the monomer. The method grafts the sulfonated conducting polymer to the carbonaceous material. The method can further comprise metallizing the polymer-grafted carbonaceous material. This application is a continuation-in-part of U.S. patent application Ser. No. 10/445,074, filed May 23, 2003, pending, which claims priority to U.S. Provisional Application Serial No. 60/382,665 filed May 23, 2002, both of which are hereby incorporated by reference. A catalyst  56 is used to induce the desired electrochemical reactions at the electrodes 20, 50. The catalyst 56 is often incorporated at the electrode/electrolyte interface by coating a slurry of the electrocatalyst particles 56 to the electrolyte 10 surface. When hydrogen or methanol fuel feed 90 through the anode catalyst/electrolyte interface, electrochemical reaction occurs, generating protons and electrons. The electrically conductive anode 20 is connected to an external circuit, which carries electrons by producing electric current. The polymer electrolyte 10 is typically a proton conductor, and protons generated at the anode catalyst migrate through the electrolyte 10 to the cathode 50. At the cathode catalyst interface, the protons combine with electrons and oxygen to give water. The electronically conductive support material  52 in the PEMFC typically consists of carbon particles. Carbon has an electrical conductivity (10 −1-10−2 S/cm) which helps facilitate the passage of electrons from the catalyst 56 to the external circuit. Proton conductive materials 54, such as Nafion®, are often added to facilitate transfer of the protons from the catalyst 56 to the membrane interface. Polymer electrolyte membranes  10 can be relatively strong, stable substances. These membranes  10 can also be effective gas separators. Although ionic conductors, PEM do not conduct electrons. The organic nature of the structure makes it an electronic insulator. Since the electrons cannot move through the membrane 10, the electrons produced at one side of the cell must travel through an external circuit to the other side of the cell to complete the circuit. It is during this external route that the electrons provide electrical power. (3) the ion clusters consisting of sulfonic acid ions, SO 3—, H+. Conducting polymers are a class of conjugated double bond polymers whose electrical conductivities are comparable to the conductivities of semiconductors to metals, in the range of 0.1 to 100 S/cm. Typical examples of conducting polymers include polyaniline, polypyrrole, polythiophene, polyfuran, polyacetylene, and polyphenylene. Both polyaniline and polypyrrole (without carbon) as catalyst support  52 materials have shown improved fuel cell efficiency (e.g., U.S. Pat. No. 5,334,292 and WO 01/15253). However, the long-term stability of these materials has not been demonstrated in electrode environments in cyclic operations. FIG. 10 is an X-ray photoelectron survey spectrum (XPS) of the sulfonated polypyrrole-grafted carbon black of Example 17. This figure shows the presence of the N1s peak and S2p peak which support that sulfonated polypyrrole has indeed been grafted to the carbon black surface. The carbonaceous material can be carbon black. The choice of carbon black in the invention is not critical. Any carbon black can be used in the invention. Carbon blacks with surface areas (nitrogen surface area, NSA) of about 200 to about 1000 m 2/g, for example, about 200, 220, 240, 250, 300, 350, 400, 450, 500, 550, 600, 650, 700, 750, 800, 850, or 950 m2/g can be used. Specifically, a carbon black with a surface area of 240 m2/g (NSA, ASTM D6556) can be used. It is preferred that the carbon black have fineness effective for metal dispersion. 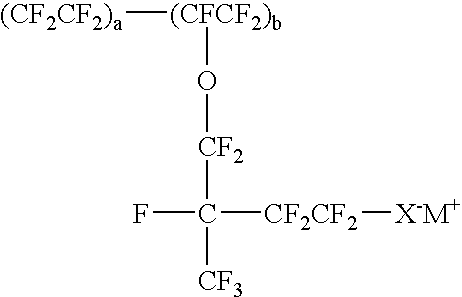 It is preferred that the carbon black have structure effective for gas diffusion. The sulfonated polymer or sulfonated monomer provide a sulfonate substituent of the general formula —SO 3M, wherein M is hydrogen or a cationic species. Any number of sulfonate groups on the polymer is better than no sulfonate groups on the polymer. Conductivity is expected to increase with an increase in number of sulfonate groups up to any theoretical maximum of sulfonate groups that can be placed on the polymer. More practically, about 0.1 to about 3 equivalent sulfonate groups per monomer unit can be on the polymer. Specifically, there can be about 0.4, 1, or 2 equivalent sulfonate groups per monomer unit on the polymer. There can be about 0.2, 0.3, 0.5, 0.6, 0.7, 0.8, 0.9, 1.1, 1.2, 1.3, 1.4, 1.5, 1.6, 1.7, 1.8, 1.9, 2.1, 2.2, 2.3, 2.4, 2.5, 2.6, 2.7, 2.8, or 2.9 equivalent sulfonate groups per monomer unit on the polymer. Membrane/electrode assembly construction varies greatly, but the following is one of the typical procedures. The supported catalyst/electrode material is first prepared in liquid “ink” form by thoroughly mixing together appropriate amounts of supported catalyst (powder of metal, e.g., Pt, dispersed on carbon) and a solution of the membrane material (ionomer) dissolved in a solvent, e.g., alcohols. Once the “ink” is prepared, it is applied to the surface of the solid membrane, e.g., Nafion®, in a number of different ways. The simplest method involves painting the catalyst “ink” directly onto a dry, solid piece of membrane. The wet supported catalyst layer and the, membrane are heated until the catalyst layer is dry. The membrane is then turned over, and the procedure is repeated on the other side. Supported catalyst layers are then on both sides of the membrane. The dry membrane/electrode assembly is next rehydrated by immersing in dilute acid solution to also ensure that the membrane is in the H + form needed for fuel cell operation. The final step is the thorough rinsing in distilled water. The membrane/electrode assembly is then ready for insertion into the fuel cell hardware. The membrane of the MEA can be an ionomer, specifically a perfluorosulfonate ionomer. More specifically, the membrane can be a poly(tetrafluoroethylene)-based cation exchange ionomer such as Nafion® (DuPont, Wilmington, Del. ; Fayetteville, NC). Nafion® is a perfluorinated polymer that contains small proportions of sulfonic or carboxylic ionic functional groups. Its general chemical structure can be seen below, where X is either a sulfonic or carboxylic functional group and M is either a metal cation in the neutralized form or an H + in the acid form. A solution containing 30 ml concentrated H 2SO4 and 60 ml of acetic anhydride was added to the slurry and stirred at room temperature for 1 hour. 100 ml of 3 M FeCl 3 solution was added to the carbon black slurry, and the stirring continued at room temperature for 1 hr. A solution containing 30 ml concentrated H 2SO4 and 60 ml acetic anhydride was added to the slurry and stirred at room temp for 1 hour. 100 ml of 10% H 2O2 solution was added to the carbon black slurry, and the stirring continued at room temperature for 1 hr. A solution containing 30 ml concentrated H 2SO4 and 60 ml of acetic anhydride was added to the powder and stirred at room temperature for 1 hour. A solution containing 30 ml concentrated H 2SO4 and 60 ml acetic anhydride was added to the powder and stirred at room temp for 1 hour. Protonic conductivity measurements were obtained based on the technique developed by Saab et al. (Saab et al., J. Electrochem. Soc. 150, A214 (2003) and Saab et al., J. Electrochem. Soc. 149, A1514 (2002)). Thin films of each material were coated onto a polycarbonate substrate. A thin film of Nafion® (1100 equiv. weight) was then affixed to the substrate adjacent to the material, contacting the edge of the material. Electrical contact was made using silver paint. Impedance measurements were obtained using a Solartron  1255B Frequency Response Analyzer, connected to a Solartron 1287 Electrochemical Interface. The CDX-975 sample was mixed with Nafion® in order to obtain conductivity values, as the carbon species alone does not provide sufficient protonic conductivity for the measurement technique. 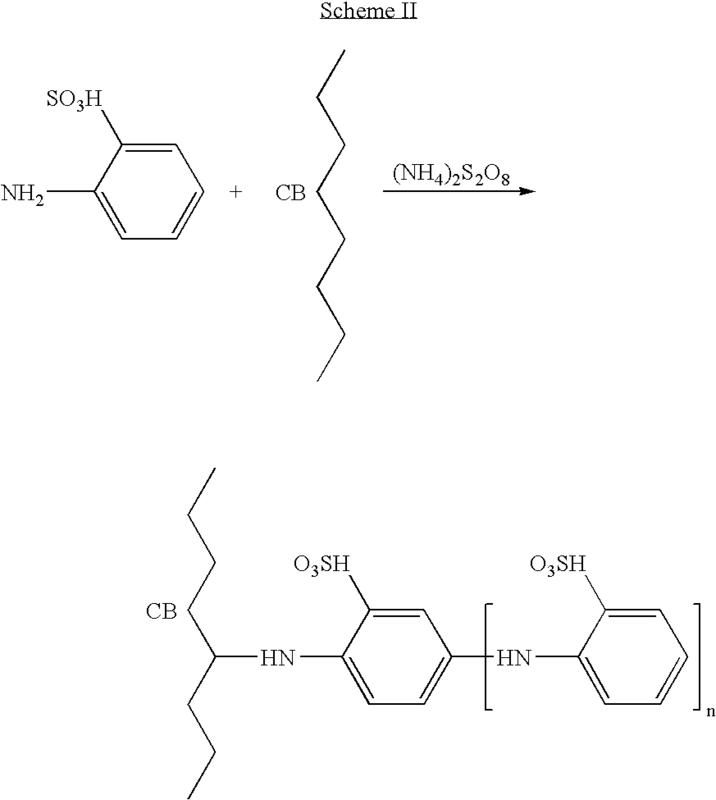 This method describes grafting of sulfonated polyaniline to carbon black surface by oxidative polymerization using ozone. 150 g carbon black beads (CDX-975, NSA surface area 240 m 2/g and oil absorption of 170 ml/100 g) (Columbian Chemicals Company, Atlanta, Ga.) was pulverized, and 30 g aniline in 50 g of deionized water was sprayed onto carbon black powder. This was followed by additional pulverization for 3 min. 30 g of concentrated sulfuric acid was sprayed onto the carbon black followed by 2 min. pulverization. The resultant carbon black mixture was transferred to a rotating drum and purged with ozone for 1 h (1000W, @ 4 ml/min) using an Ozat® compact ozone generator made by Ozonia Corporation, Switzerland. 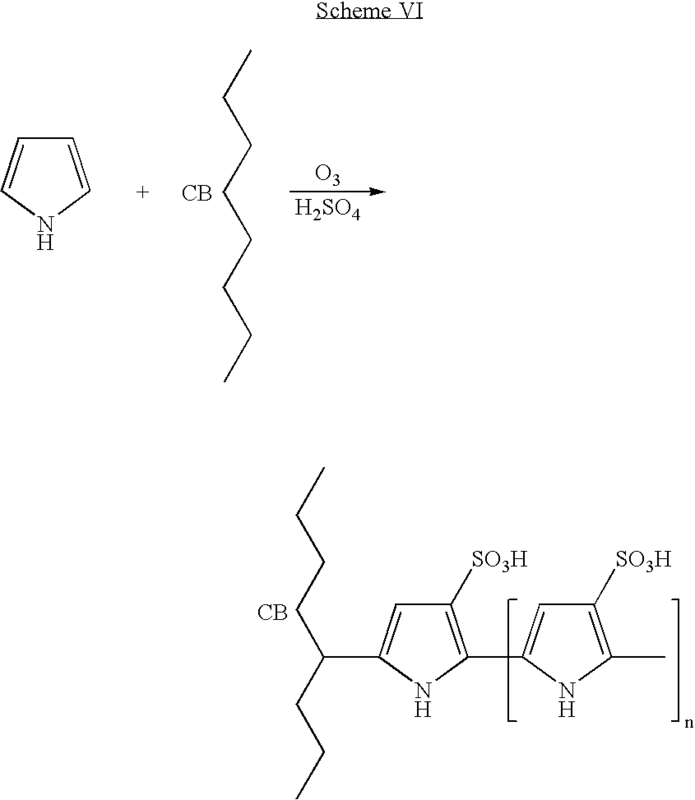 The resultant carbon powder contained sulfonated polyaniline-grafted conducting polymer as shown in Scheme V.
This method describes grafting of sulfonated polyaniline to carbon black surface by oxidative polymerization using ozone. 150 g carbon black beads (CDX-975, NSA surface area 240 m 2/g and oil absorption of 170 ml/100 g) (Columbian Chemicals Company, Atlanta, Ga.) was pulverized. 15 g aniline-2-sulfonic acid and 15 g aniline were dissolved in 50 g of deionized water. The mixture was sprayed onto the carbon black powder followed by additional pulverization for 3 min. The resultant carbon black mixture was transferred to a rotating drum and purged with ozone for 1 h (1000W, @ 4 ml/min) using an Ozat® compact ozone generator made by Ozonia Corporation, Switzerland. 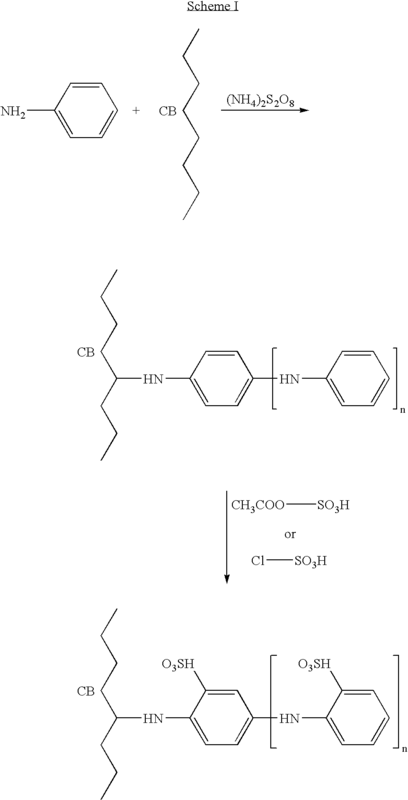 The resultant carbon powder contained sulfonated polyaniline-grafted conducting polymer as shown in Scheme III. FIG. 9 shows the X-ray photoelectron survey spectrum of unsulfonated polyaniline-grafted carbon black containing the nitrogen and sulfur functionalities from sulfonated polyaniline. 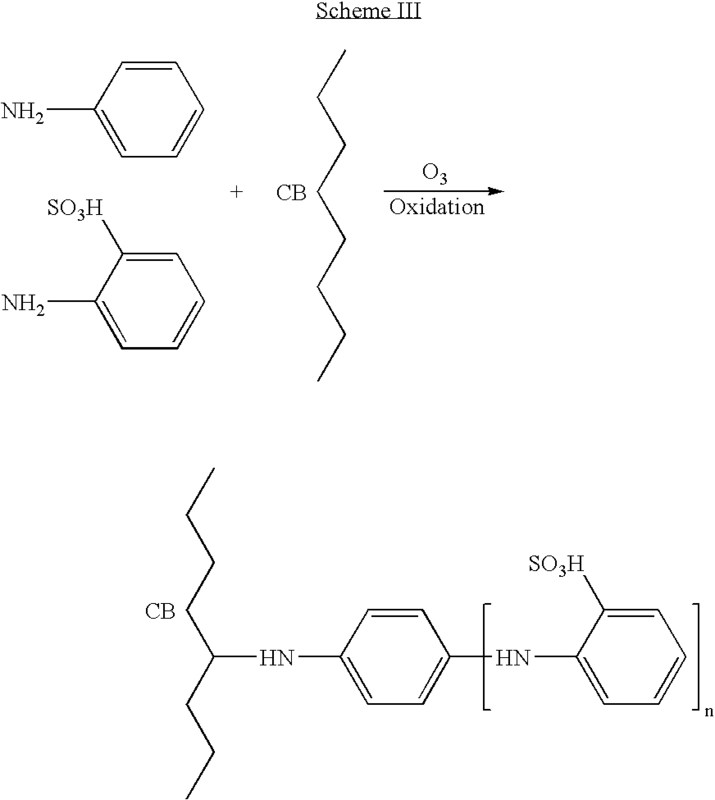 This method describes grafting of sulfonated polypyrrole to carbon black surface by oxidative polymerization using ozone. 150 g carbon black beads (CDX-975, NSA surface area 240 m 2/g and oil absorption of 170 ml/100 g) (Columbian Chemicals Company, Atlanta, Ga.) was pulverized, and 30 g pyrrole in 50 g of deionized water was sprayed onto the carbon black powder. This was followed by additional pulverization for 3 min. 30 g of concentrated sulfuric acid was sprayed onto the carbon black followed by 2 min pulverization. The resultant carbon black mixture was transferred to a rotating drum and purged with ozone for 1 h (1000W, @ 4 ml/min) using an Ozat® compact ozone generator made by Ozonia Corporation, Switzerland. 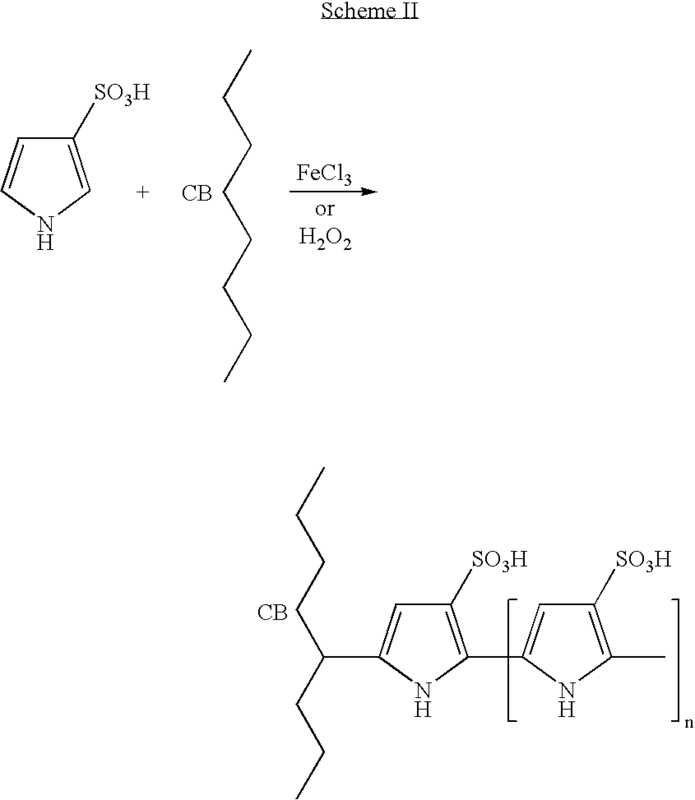 The resultant carbon powder contained sulfonated polypyrrole-grafted conducting polymer as shown in Scheme VI. FIG. 10 shows the X-ray photoelectron survey spectrum of sulfonated polypyrrole-grafted carbon black containing the nitrogen and sulfur functionalities from sulfonated polypyrrole. 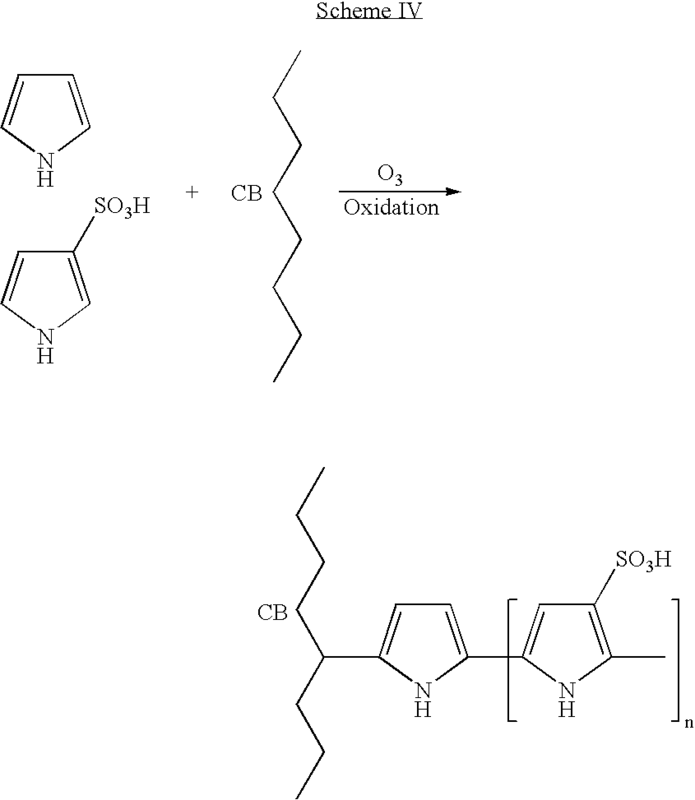 oxidatively polymerizing with an oxidizing agent comprising ozone a monomer of a conducting polymer containing hetero atoms with particulate carbonaceous material to form a conducting polymer-grafted carbonaceous material, wherein either the monomer is sulfonated or the polymer is subsequently sulfonated, to thereby produce a sulfonated conducting polymer-grafted carbonaceous material. 2. The method of claim 1, wherein the carbonaceous material is carbon black, graphite, nanocarbons, fullerenes, fullerinic material, finely divided carbon, or mixtures thereof. 3. The method of claim 1, wherein the carbonaceous material is carbon black. 4. The method of claim 1, wherein the monomer of a conducting polymer is an amino aryl or a nitrogen heterocycle. 5. The method of claim 1, wherein the oxidatively polymerizing comprises adding ozone to a mixture of the carbonaceous material and the monomer of the conducting polymer. 6. The method of claim 5, wherein the mixture of the carbonaceous material and the monomer of the conducting polymer further comprises an acid solvent to form a slightly acidic environment. 7. The method of claim 6, wherein the slightly acidic environment is a pH of about less than 7. 8. The method of claim 6, wherein the slightly acidic environment is a pH of about 3 to about 4. 9. The method of claim 1, wherein the conducting polymer is polyaniline, polypyrrole, polyfuran, polythiophene, poly(p-phenylene-oxide), poly(p-phenylene-sulfide), substituted conducting polymers, or a mixture thereof. 10. The method of claim 1, wherein the polymer is directly sulfonated after oxidatively polymerizing the monomer with the carbonaceous material. 11. The method of claim 1, wherein the monomer is a sulfonated monomer of the conducting polymer. 12. The method claim 10, wherein the direct sulfonation is by addition of a sulfonating agent. 13. The method claim 12, wherein the sulfonating agent is chlorosulfonic acid. 14. The method claim 12, wherein the sulfonating agent is acetylsulfonic acid. 15. The method of claim 1, further comprising metallizing the conducting polymer-grafted carbonaceous material. 16. The method of claim 15, wherein the metallizing comprises adding a metal-containing material to the conducting polymer-grafted carbonaceous material. 17. The method of claim 16, wherein the metallizing further comprises adding a reducing agent. 18. The method of claim 15, wherein the metallizing is plantinizing. 19. The method of claim 17, wherein the reducing agent is formaldehyde, sodium borohydride, hydrogen, hydrazine, hydroxylamine, or a mixture of reducing agents. 20. The method of claim 16, wherein the metal-containing material is chloroplatinic acid, platinum nitrate, platinum halides, platinum cyanide, platinum sulfide, organoplatinum salts, or a mixture thereof. 21. A composition made by the method of claim 1.